What later became known as “The Perfect Storm” was first referred to as “The Halloween Storm,” until Bob Case from the National Weather service coined the name we know it by today. No matter what you call it, it was a storm of monstrous proportions that battered the East Coast – especially New England – unmercifully. It spun in place just off the coast, subjecting the shoreline to days of punishing rain, near-hurricane force winds and dangerously high surf, and the inevitable property damage that comes along with these conditions. Extensive coastal flooding resulted along the New England coast, especially in Massachusetts. Damage due to the storm ranged as far north as Newfoundland, and as far south as Jamaica. The chain of events that became The Perfect Storm began on October 27th near Bermuda, when Hurricane Grace formed and moved toward the coastline of the southeastern United States. Grace was still moving north two days later when she bumped into a massive low pressure system that was chugging south from Canada. This meteorological clash of the titans resulted in 40-to-80 foot waves by October 30th. The storm continued to rotate out in the Atlantic on Halloween, but the storm had abated enough that trick or treaters could brave the weather with umbrellas and rain gear. But then, incredibly, on November 1, the storm became a hurricane. The National Hurricane Center made the decision not to name the storm to avoid panicking already stressed-out New Englanders, as the storm was so small and was heading away from the U.S. coast. 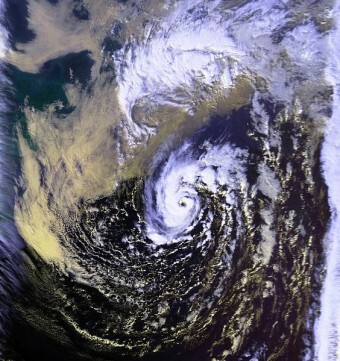 Landfall was made the next day in Nova Scotia as a weak sub-tropical system with very little punch. Most people have seen the movie about the fishermen lost at sea during the storm, and have suffered through the cast trying to mimic the local accent while failing miserably. (Diane Lane is the worst offender, alternately sounding like a 1930s B-movie New York shop girl or Betty Boop.) Many New England storms have been worse in terms of property damage, storm ferocity and loss of life, but this is still one of the most talked about storms to hit New England in history.